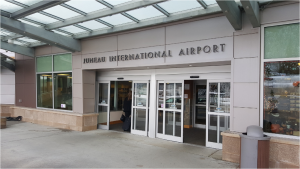 The Juneau International Airport is one of only two ways to enter and exit Juneau. It is a relatively small airport with one terminal. It is also one of the more tricky airports to enter for pilots due the same tricky weather patterns that keep Juneau in the rain and fog. 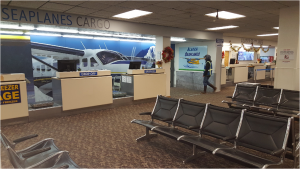 The airport is located about 8 miles northwest of downtown Juneau at 1873 Shell Simmons Drive off Glacier Highway. When arriving at Juneau International Airport, travelers will find easy directions and a short walk to the baggage claim area. The crews get right to business in downloading the plane. Baggage can be claimed with a relatively short wait. 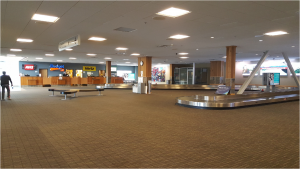 Doors from the baggage claim area open right to the front of the airport and pick up and drop off area. However, do not allow your friends to simply wait for you at the vehicle pickup area. The hawkish guards will immediately chase them away. It is for loading and unloading only! There is a parking area across the street. 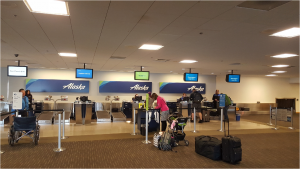 When departing Juneau, visitors can experience a quick luggage drop off. However, as in any airport, be sure to arrive at least an hour before the flight to ensure your luggage makes it on the same plane you are on! Travelers can even catch a hop on a seaplane. Before entering security, travelers can purchase last minute gifts at the local gift shop. Security is efficient and friendly. 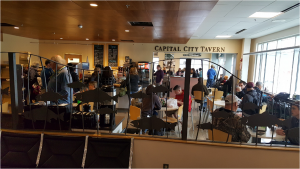 Once through security, travelers can relax at the local cafe, the Capital City Tavern, or have a locally brewed Alaskan at the bar. Out by the gates, travelers can even charge up their electronic devices at the charging stations. 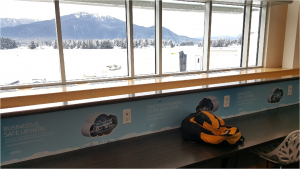 The tiny airport offers a charming taste of what travelers can expect on a visit to Juneau – a charming small town friendliness filled with a love of local art and the outdoors.